Online Marketing has eventually became a huge advertising industry. According to a research, Digital Marketing spending is going surpass traditional advertising in 2018. This also explains how the advertising is evolving and what’s going to be the future of advertising with How to Advertise on Facebook Tutorial. Online Advertising has a lot of features which you can’t match, such as the metrics you have, the option of deep targeting, understanding your buyers and tweaking it with their buying behaviour, these are some of the features which are enough to describe it as a much better option then traditional advertising. 3.5 Frequently Asked Questions with Facebook Ads? We will cover the following segments on facebook advertising in this article. There must be someone telling you that advertising on facebook isn’t a good idea or the results are very poor, but most of them have not practically done it yet, because if that was true then why there are more then 3 million happy advertisers on facebook? Without a doubt, Facebook advertising is one of the essential online marketing tools along with the popular search engine marketing options such as Bing Ads and Google Adwords. Over the time, Facebook ads have been evolved as a major part of today’s online marketing arsenal. Marketers and Social media experts brainstorm, explore, and try to figure out how to start the facebook advertising that brings great results. And it was because, over the past few years, businesses are learning and exploring whether or not to invest into the Facebook ads because Facebook ads are important today, brands find a diversified demographic and geographic data of audience to target without spending thousands of dollars. So, here is the deal! Are you struggling to setup an online advertising campaign? Did you find it difficult to get started with your facebook advertising? Social Media Today published an article in the past about Facebook ads and general online advertising terminologies in order to guide new advertisers who really don’t know the terms like CTR, Campaign Budget, Campaign Objective, Clicks, Impressions, Conversion rate, Actions and much more. In order to make sure that you don’t go off the track, it’s necessary to know the basic elements of facebook advertising. The proper definition of intent needs to be done. An advertiser should know the purpose of the campaign in order to get success. There would be different campaigns for Facebook page likes and Website Clicks. Clarify the mission before starting your ad campaign. In any type of advertising, an advertiser must know that which segment of the audience a customer wants to reach. It would be based on one or more demographic or geographic signals. Make yourself clear with the type of audience you want to target. The sufficient budget might be the most important thing for any facebook campaign, although the budget never guarantees the success of the campaign, your strategy does it. Arrange the appropriate budget to run your campaign. 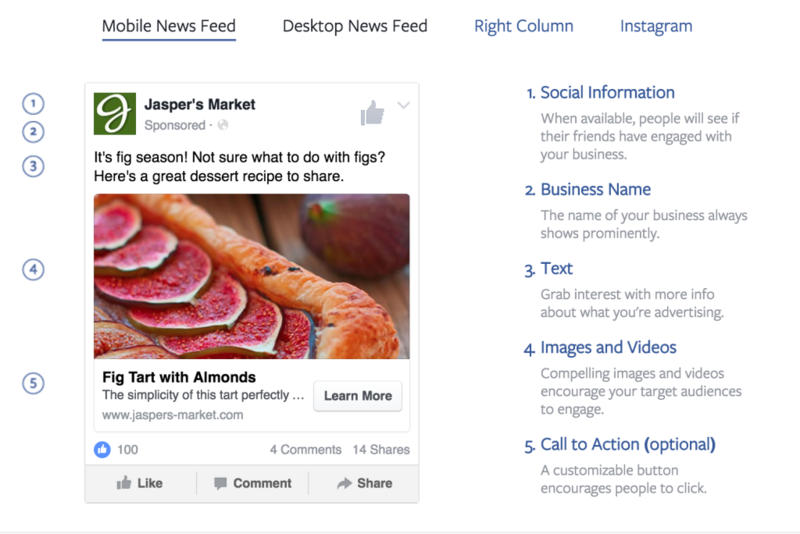 With Facebook Ads, you can run four type of ads. Open up the settings menu from the top right dropdown menu. Click on the ‘Create Ad’ option to proceed to the ads section. This is just a beginning of an ad campaign setup. Further parts are a bit technical as compared to the initial one. In the next step, you have to select the campaign type according to the objective. Facebook provides a variety of options to advertisers to select the most suitable campaign type in order to achieve the best results. From page likes to website visits, app installs to conversion improvement, app engagement to boosting the post, event promotion to video views – Facebook has got all it covered for you. Choose the campaign type wisely. 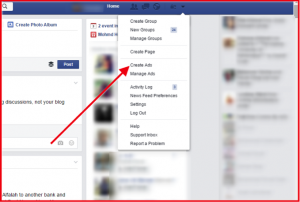 As facebook advertising needs your certain facebook page to run the ad campaign. So at this stage, choose the relevant page to start your advertising campaign. 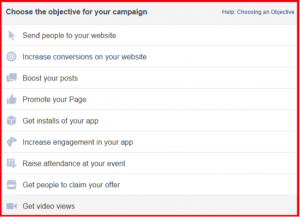 Once you choose the facebook page, you’ll be moved towards the campaign optimization section where you need to set up the ad design and audience reach through various options. Define the audience type in this area to target through your ad campaign. From age to gender, location to languages, every detail would matter in the campaign’s success. If you make a mistake at this point, it might sabotage your whole ad campaign. For instance, your target market is Asia, and you also add up Australia or the United Kingdom in your locations to target, it would certainly increase the price of your ad, and might add useless clicks, engagements, and likes from those areas where you don’t need. 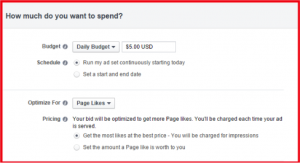 The bidding area helps you to define that how much do you want to spend on your ad campaign. You would select the daily budget for your campaign along with the price bidding in this area. Ad scheduling is an option in this area to finalize whether or not to run the ad throughout the day. You have the option to select a specific schedule of the ad running. 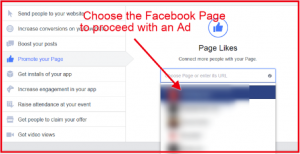 After choosing your facebook page to run the ad campaign, you would have the option to upload your banner ads. You might be able to upload more than one image for your campaign. The size of the image should be 1200px x 627px. You can use Canva or Bannersnack to get your banner ad designed for your ad campaign. You would be able to write the headline and short description depending on the ad type on Facebook. Write short, precise, and engaging text in the description area to briefly tell the audience that why they should click on your facebook ad. Usually an ad has to follow the following specifications, however facebook have different policies depending upon the type of ad you want to run. 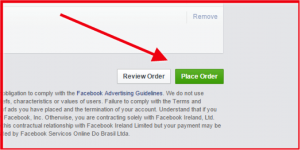 For complete list of guideline instructions by facebook, click here. You can follow my guide on How To Write An Advertisement which converts well on Google and Facebook? to tweak your ad into a profitable one! At last, you need to submit the ad campaign for the approval. It might take 30 minutes to 5 hours to get approved. Once your ad is approved, it will go live and start showing up on the facebook. The ad’s design matters a lot. It’s true that the design attracts people. Not only does it attract the audience, but encourages the target audience to click and explore the content further. The design of an ad isn’t just about a suitable sized banner with text. The Psychology of colors, text & fonts, and the written message all mix up together to create an impact. It won’t matter anymore that how well your description is written or how good your ad banner is if you don’t know what call-to-action button or feature to use on your facebook ad. The experience shows that advertisers should clearly remember whether they want likes or clicks from their facebook ad. 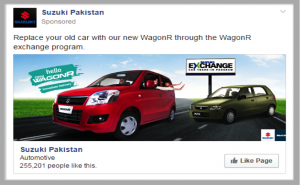 They have written a message to tell the intent, plus they have chosen the ad campaign type with the objective of ‘Page Likes’ – So, people who would like to know further about Suzuki Car offers, they might have liked this page. Like Page button represents the call-to-action feature in this ad. Facebook understands the importance of Call-to-action buttons, which is why they added this feature to the pages back in 2014. The importance of CTA or Call-to-action buttons can be analyzed by Hubspot’s feature to create call-to-action buttons. Do checkout 7 Call to Action Examples which teaches you on how to utilize it for maximum conversions. The tools like ButtonOptimizer and TheButtonFactory help the companies, web designers, and online marketers to generate buttons to improve their sites’ CTA performance. 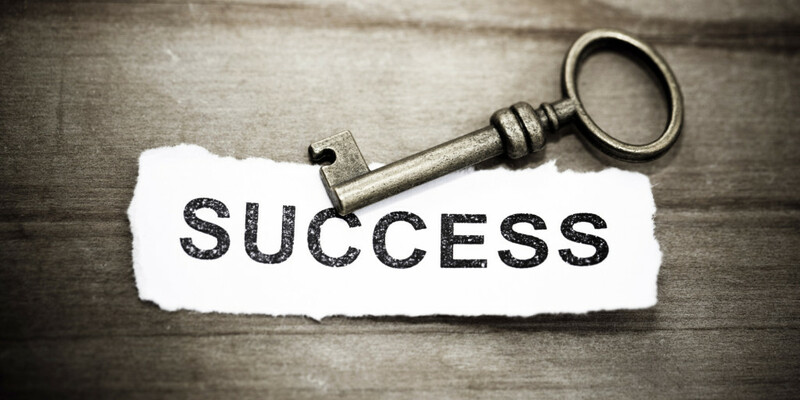 It’s a fact that without an engaging message in your ad campaign, you won’t get success. So, in order to succeed with your facebook ad campaign, create a meaningful, attractive, and engaging message to mesmerize the audience. The more they (audience) get amazed, the better. 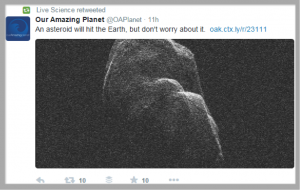 It sounds scary – An asteroid will hit the earth! but it also says that don’t worry about it – It makes people little curious, shocked, and satisfied after reading the line, but they want to know what’s going on with this asteroid thing, and many of them will open up the link to check it out. The story of engagement doesn’t end here – A great ad copy or a well-written description won’t do the rest of the job, so using automation services like Uberflip would help you to identify the CTA of your content marketing. The tools like Wishpond and AdEspresso will assist you to run your facebook ad campaigns smoothly by providing you the stats on the go without sitting 24 hours on the Facebook site. If one thing isn’t working for you, it doesn’t mean the system isn’t perfect, what you need to do is critically evaluate, understand and tweak according to user’s. It’s very important for you to understand, what kind of ads your user’s do not like, how they convert, what your competitors are doing to convert and what things your landing page is missing! Only spending money isn’t going to convert you into a winner, success isn’t easy and it requires efforts, patience and testing! Frequently Asked Questions with Facebook Ads? Question : Can I Advertise on Facebook For Free? Question : How Much I need to Spend on Facebook to See the Results? Answer : There is no minimum and no maximum, just spend with whatever you are comfortable with it to see how it’s working for you. For beginners, I usually recommend to start with $15 to $25 per day to see how does it perfume and then scale depend upon the budget and other factors. Question: My Ad has been Disapproved and it’s saying your image have more then 20% text? Answer: As of now, Facebook doesn’t allow to have more then 20% text in your image ads, to improve the user experience, however there are news that this rule is going to be eliminated soon. Question: My Card is not working with Facebook Advertising? Answer : Please check what type of visa/mastercard card you have, usually there are two types of card, one is debit visa/master card and the other is credit visa/master card. The one’s which usually don’t work are debit based cards, so contact your bank on obtaining a credit card. I have tried to discuss all about facebook advertising and why you need to do it. 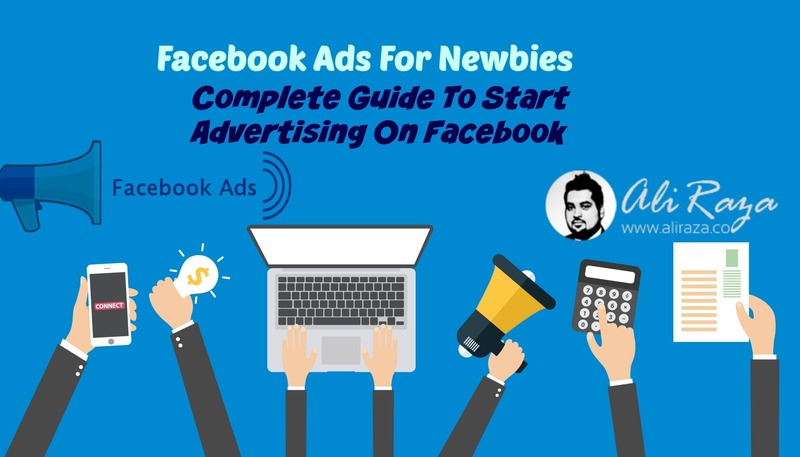 I also tried to highlight on how to create your first ad along with success factors for facebook advertising, however in marketing, there’s a one secret to success and that is to testing, testing and testing. You learn and improve via testing, analyzing and learning from your mistakes. The success of any marketing strategies lies with it, so never stop testing! This was my part with teaching you on How to Advertise on Facebook, Now, It’s your turn to tell me about your plans for Facebook advertising. It’s a great option with a huge pool of audience. What matters is, how do you learn it and how well do you make your start with facebook advertising. What else would you do to make your facebook ad campaign successful? In anyway, If you are interested in hiring me to setup and manage Facebook Ads Campaign for your business, you can reach me today! It all depends on your marketing goals, the first thing you need to consider is to define the objectives behind running the campaign. Good Luck! Thanks For Sharing Very useful Informational.But I have one Question.Can I Run Ads With Target Audience ? What do you mean by Target Audience actually? Nice Tutorial Raza Bhai. But i have one question.. Should we use tight targeting or broad targeting in Interest ??? What do you mean by tight targeting? Can you elaborate a bit more? I have already tried facebook ads once to promote my FB page but didn&apos;t got the expected result. Afer reading this article I realize that I made some mistakes there. Next time your tips will definitely help me to bring enough from facebook ad campaign. By the way I came here from Matthews income roundup post. So thanks to Matthew also.